CHICAGO, IL (November 2014) – Give your favorite angler a fishing gift they’ll love for months to come. Consider buying a subscription to Mystery Tackle Box. Each month your angler will receive a box containing at least $20 in lures and tackle valued at $20. The contents vary each month offering a great way to try different products and build a better tackle box. It’s a fun and practical gift!Subscribe for 3, 6 or 12 months’ worth of surprises or purchase a single gift box starting at $15. Shipping is free with any gift subscription. Beginners and avid anglers will be pleased with the monthly assortment of quality fishing products – never knock-off products. Every Mystery Tackle Box will contain at least $20 worth of products and you can expect to get 5-10 products a month on average. 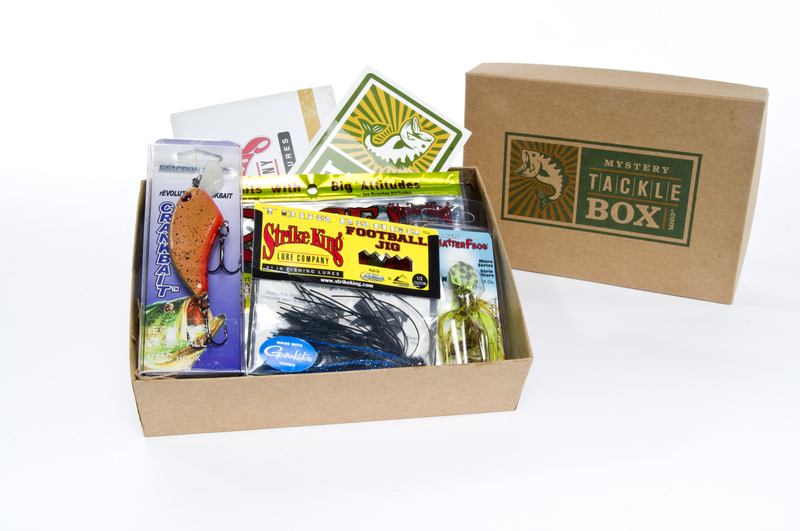 Each box includes as “About Your Box” card that explains a little more about each bait as well as a unique link to our website to watch videos, read product reviews and learn different rigging options. Each box also includes an issue of Dibble Digest, Mystery Tackle Box’s monthly fishing magazine, and a Mystery Tackle Box decal. You can select from a variety of Mystery Tackle Boxes based on species. The Bass box is geared toward freshwater Largemouth and Smallmouth bass. The Inshore Saltwater box is geared toward the following saltwater species: Redfish (Red Drum), Speckled Trout (Sea Trout), Snook, Striper, Flounder and Calico Bass. The Ice Fishing box contains a variety of baits for targeting panfish (Bluegill, Crappie, Perch), Lake Trout and Pike under the ice and is available during the Ice Fishing season. They’ll remember your thoughtfulness each month when the Mystery Tackle Box arrives. And when they’re catching a lunker! Cross that name off your list and visit mysterytacklebox.com today. Mystery Tackle Box is a monthly subscription service that sends out some of the most exciting fishing gear right to your home. Our mission is to take the excitement of being on the water not knowing what you’re going to catch and bring that same excitement to your home each and every month. For just $15 per month, Mystery Tackle Box introduces both expert and novice anglers to the latest products and techniques in the fishing industry by sending you a box filled with fishing lures and baits each month. We work with the largest and most well known brands as well as smaller companies that you would otherwise never get to experience. Mystery Tackle Box also makes a great gift for anyone who loves fishing. We offer gift subscriptions and printable gift certificates making it the perfect last-minute gift. Learn more at MysteryTackleBox.com. About Firefly PublicityVisit http://www.fireflypublicity.com for more information about its public relations services for outdoor products. Firefly Publicity works closely with writers and editors to place products in media like magazines, newspapers, on-line content, radio and television. Public relations is a cost effective way for companies to maximize their marketing or advertising budget. Firefly Publicity is a results-oriented pr firm located in Red Wing, Minnesota. If you’re interested in gaining exposure for your company’s products, please contact Kim Emery at Firefly Publicity. MINNEAPOLIS, MN (November 2014) — Choose a practical gift that will make the holidays warmer and brighter for you and the people on your shopping list.1. Zippo® Hand Warmers provide up to 12 hours of gentle, consistent, odorless heat — more than disposable warmers — and they’re refillable with Zippo Premium Lighter Fluid, so they don’t end up in landfills. Each Hand Warmer features all metal construction and comes with a fleece warming bag, so the heat is always gentle on your skin. Personalize your gift with engraving at zippo.com. Starting at $19.95, these are a great gift at a great price for anyone who enjoys cold weather activities. 2. When you want to warm up by a roaring campfire fast, Zippo® Cedar Fire Starter pucks are the way to go. Made from wax and compressed cedar chips, they take the place of tinder and light kindling fast. Each one is scored to break into 4 pieces, for 4 fires. This great stocking stuffer starts at $1.95. 4. Zippo® Rugged Lanterns brighten your night. Designed to be the most durable on the market, the lantern can survive drops from as high as five feet. The waterproof Zippo Rugged Lantern even floats. LED lights are popular with campers because they don’t cause fires or emit terrible odors. The Rugged Lantern draws power from a rechargeable lithium ion battery and offers a battery life / runtime of 10-hours, 15-hours or 40-hours at the high, medium or low brightness setting respectively. A flexible and detachable handle lets owners hang or carry the lantern anywhere. While most LED lanterns barely last beyond one season, this durable lantern has a 5-year limited warranty. Suggested retail is $89.95. 5. The Zippo® Emergency Fire Starter doesn’t even rely on a flame to start a fire. It uses a simple flint wheel to spark water-resistant, waxed tinder sticks that store in a waterproof case. In emergencies, where matches or lighters are unavailable, this kit can start a fire almost instantly and may save lives. Some of the outdoors’ top people think so, too. It was awarded the Seal of Approval by the North American Hunting Club. Retailing at $9.95, this is a thoughtful gift for the outdoorsy person on your list. 6. The Zippo® Heat Gift Set includes a windproof lighter, chrome hand warmer, and premium lighter fuel (4 fl. oz. can). The windproof lighter is refillable, has an easy one-hand operation with flint wheel, and backed by our lifetime guarantee. The hand warmer has a sleek, thin metal design that fits in and out of pockets, provides 12 hours of warmth, and is reusable and virtually odorless. The premium lighter fluid provides optimum product performance. From hunting to hitting the slopes, this set has everything needed to stay warm in the outdoors from $39.95. 7. Going to an event and need a gift for the host? The Zippo® Fire Gift Set (from $29.95) is a practical gift that literally helps start the festivities. The gift set includes a cedar fire starter, satin silver flex neck utility lighter, and premium butane fuel (1.48 oz. can). The cedar fire starter is made of compressed cedar and wax, lights quickly, and will start 4 fires. The flex neck utility lighter has dual-flame advanced burner technology, adjustable flame, and precision lighting in a slim, powerful nozzle. The premium butane fuel provides optimum lighter performance. 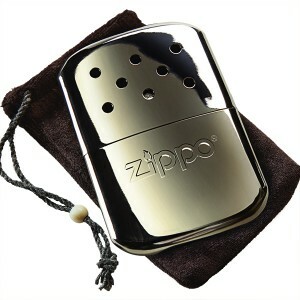 Zippo products are available for purchase at many fine retailers including zippooutdoor.com. About ZippoBorn from Zippo’s legacy of fire, durability and reliability, Zippo offers a full line of products designed to enhance the outdoor experience. Whether in the backyard, the campsite or tailgating, Zippo offers the performance consumers expect while establishing a new standard for quality that sets the brand apart in the marketplace. Celebrating more than 80 years of business in Bradford, PA, Zippo is one of the most recognized brands in the world, and has produced over 500 million windproof lighters, each backed by an unparalleled lifetime guarantee.